grass stains: So a tree fell on our house. So a tree fell on our house. I was going to pick the big boys up at the Y yesterday afternoon and head to karate when I got a call from my neighbor. It's rare that she calls me, because we aren't really friends socially, but I wasn't alarmed. 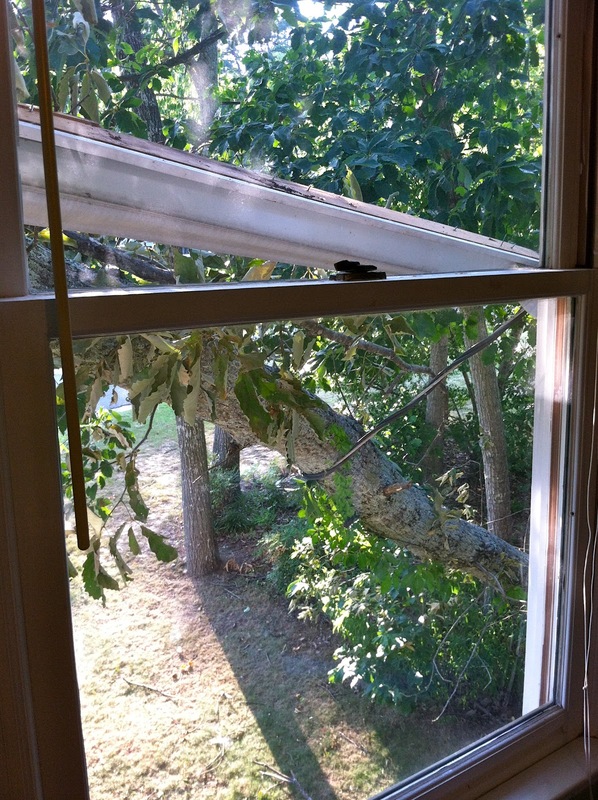 Then, after a few pleasantries, she said, "Well, I wanted to let you know that a tree fell on your house." And, just like in a TV show, I dumbly asked, "What?" She repeated, "A tree. Fell on. Your house." 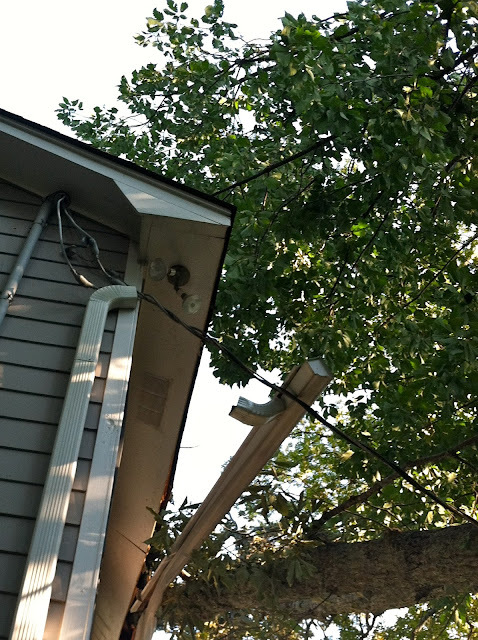 She told me that it looked like fairly minor damage to the roof and gutters, but said that it looked like it was hanging on our power lines. I said I'd be home in 10 minutes, and turned the car around to get home as quickly as possible. Nathaniel and Nick, piecing together what had happened from my side of the conversation, were of course THRILLED by this information. Nathaniel even found the silver lining: "Mommy. Look at the bright side: Now we have an ACTUAL TREEHOUSE." When we pulled into the driveway, there were lots of "oohs" and "ahhs" from the backseat. I, in the front seat, was substantially less impressed. I'm so grateful the damage isn't worse. It fell squarely on top of Jake and Nick's room, and Jake's bed lies directly under those two windows. Part of the tree's weight was resting on the power lines to the house, and I'm grateful that Alabama Power was able to get a truck to us within 30 minutes of my call. I'm grateful that our insurance company accepts claims by telephone until midnight, so I was able to get a claim number and an adjuster's name and phone number by bedtime. I'm grateful that our power interruption was minimal and that none of our neighbors lost power. I'm grateful that our neighbors rallied around us, offering help of any kind. Our next-door neighbor brought me the numbers of the tree surgeon and renovation expert who handled their job when this exact same thing happened to them last year. And I'm grateful that it wasn't much, much worse. This will be an inconvenience for a while, certainly, but in the big scheme of things, it will be a blip on the radar. AND, the boys got to see a bucket truck in action. Many thanks to the team at Alabama Power last night, and to Jamie Sandford for answering my questions via Twitter (@jsandford) and checking back in with me after 10 p.m. to see if we'd been taken care of. For having a tree fall on our house for no reason, it actually wasn't all that bad. you've introduced to your post. They are really convincing and will definitely work. Nonetheless, the posts are very brief for starters. Could you please lengthen them a little from subsequent time? Thanks for the post.